"Whew, that's one terrific spread!" 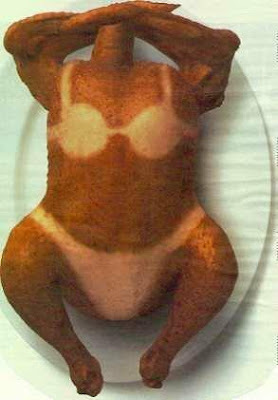 "I'm in the mood for a little dark meat." "Tying the legs together keeps the inside moist." "Talk about a huge breast!" "If I don't undo my pants, I'll burst!" "Are you ready for seconds yet?" "Are you going to come again next time?" "It's a little dry, do you still want to eat it?" "Just wait your turn, you'll get some!" "Don't play with your meat." "Just spread the legs open & stuff it in." "Do you think you'll be able to handle all these people at once?" "I didn't expect everyone to come at once!" "You still have a little bit on your chin." "Use a nice smooth stroke when you whip it." "How long will it take after you stick it in?" "You'll know it's ready when it pops up." "Wow, I didn't think I could handle all of that!" "Just lay back & take it easy...I'll do the rest." "How long do I beat it before it's ready?"